These blocks of creamy joy are made with homemade honeycomb. I love making honeycomb – its like having a mini science class. 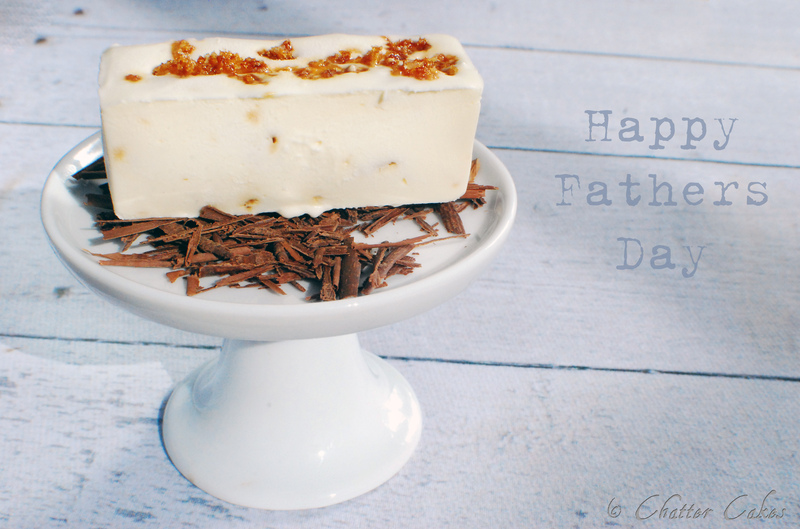 The reason I’ve made these for Fathers Day is that I remember that my Dad has always liked honeycomb, and remember at one point when he was trying to give up smoking, he said he was addicted to Crunchies. Can’t blame him….om.nom. Prepare a sheet of baking paper and put onto a tray. 1) Heat the sugar and golden syrup together on a low-ish heat, melting the sugar. Constantly stir. Once the sugar is more or less melted, increase the heat and darken the mixture slightly. This is a difficult one to explain, and making honeycomb might take several times to get right. 2) When its a bit darker in colour, you’re nearly done. This is the bit you have to act quickly. Whilst still stirring, add the bicarbonate of soda and quickly stir it in to the sugar mixture. You will see it all puff up – QUICKLY pour the mixture onto the prepared baking paper tray. It will start setting quickly. Leave on the side to fully set hard. The ideal honeycomb should not be chewy, but will snap easily. 1) Whisk the double cream in a large bowl until you get to the point that you can lift up the spoon and drizzle the cream so that it keeps its shape. 2) Add the condensed milk, and whisk again until it gets back to the same state as the cream was before. 3) Fold in the honeycomb, but don’t stir. 4) Pour ice cream mixture into a tin that is covered in cling film (which allows you to remove it easily later). I used a brilliant mould from http://www.siliconemoulds.com to set my mixture in. It gives the perfect portions. 5) Put into freezer and set overnight. I served it with chocolate shavings, which gives it a slight ‘Crunchie’ taste. Thanks Tess! Can’t wait to sample the real thing in the near future.